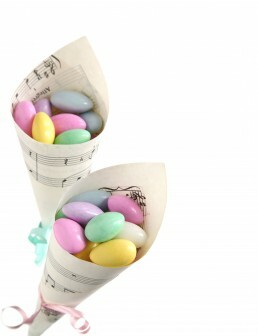 Sugarcoated almonds have a very ancient history: they were widespread among the ancient Romans who used them to celebrate their events as births and marriages. During the Roman age almonds were covered with honey and flour because the sugar wasn´t yet known. Then sugarcoated almonds were used also for therapeutic purposes. A bitter drug were covered with a sweet shell to make it more pleasant. In the 1700s the Arabs brought sugar to Europe that in the Middle Ages it became the main ingredient of confectionery production substituting the honey. With the spreading of sugar in the confectionery world, the sugarcoated almond became the delight that we all know. Sugarcoated almonds are produced from the Middle Ages in Molise region. The ancient gourmet confectionery tradition in Molise was born in Benedictine monasteries in the province of Isernia. During the centuries working processes refined more and more. In the 1700s sugarcoated almonds were prepared in large boilers powered with coal fire and swung constantly to prevent the almonds from sticking together. This process lasted four days to give time to sugar to make a fairly thick coat over the almond. The heir of this ancient gourmet confectionery tradition is Dolceamaro company from over 40 years thanks to its historical brand Papa Confetti e Cioccolato that produces sugarcoated almonds in Molise according to the ancient customs but with a contemporary touch.